Kristen Gwynne is a New York–based journalist whose work has appeared on AlterNet, Salon and RollingStone.com. 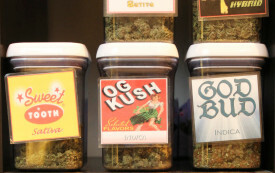 Can Medical Marijuana Survive in Washington State? Legalization in the Evergreen State has led to parallel marijuana industries. Is there room for both? Who Will Legalize Pot Next? After election day victories in Colorado and Washington, marijuana legalization activists are gearing up for more.